Sometimes more privacy is required for a client and the room is so large it is difficult to utilize the existing walls within the room. 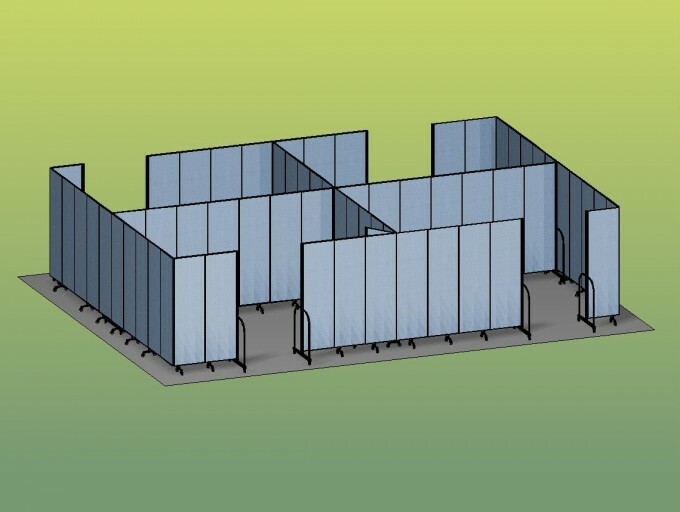 This plan shows how Screenflex Portable Room Dividers are used to satisfy the needs of the client in such a case. The acoustical portable walls are used to not only create the interior dividers between the rooms, but also to create the exterior walls as well. At set up time, the tables and chairs are moved into place first. Then the portable walls are likewise moved into place and unfolded as shown to create the rooms. The acoustical properties of the room dividers help absorb sound.